How good of shape must I be in for one of your trips? Anyone in reasonable shape can do any of our scheduled trips. If you have questions about your ability to carry a 25-30 lb backpack for 5-6 miles per day you should consult your doctor before booking a trip. How many miles per day do you hike? On average, we hike between 5 and 8 miles per day. Depending on the trip, we may hike as many as 12-14 miles in a day. Most trips have at least one layover day where clients can participate in a day hike or simply enjoy the beauty and quiet of a day in camp. How does your trip rating system work? We like to refer to our rating system as something akin to a "sweat factor". Anyone in reasonable shape can do any of our scheduled trips. The rating is simply an indication of how hard you'll have to work on the trip. A person on one of our strenuous trips works a lot harder than that same person works on a fairly easy trip. Why are your trips more expensive than, say, Sierra Club trips? We've had a number of clients ask us why our trips are somewhat more expensive than trips to similar areas by groups such as the Sierra Club. Here's why: We limit the number of clients on each trip to 10 people (including guides) in order to ensure a true wilderness experience and to have less of an impact in the areas we travel. We provide transportation from the base city to and from the trailhead making travel easier for our clients and causing less impact in the area of the trailhead. Our guides do all meal preparation and cleanup. 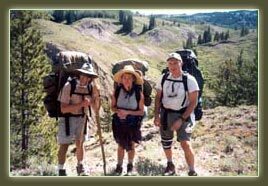 Finally, our guides are all outdoor professionals, intimately familiar with the areas in which they guide and certified in wilderness first aid or higher medical training. The amount of weight you will have to carry varies depending on the length of the trip and the number of people on the trip (and how closely you stick to the items listed in the equipment list we provide). Generally, you'll be carrying between 25-35 lbs.